Today I have a fabulous, fast and fun dinner recipe for you. If you love chicken wings, you will love these pizza sticks. I threw this together in no time at all and using a rotisserie chicken makes this even easier. I love meals like this that are so simple and absolutely delicious. Heat oven to 400 degrees F. Spray a cookie sheet with cooking spray. Press pizza dough into a 15-inch by 10-inch rectangle (this doesn’t have to be exact, just close). Place dough onto baking sheet then bake for 8 minutes. While the pizza crust bakes, add buffalo wing sauce and shredded chicken to a medium saucepan over medium heat. Cook, stirring occasionally, 3 to 5 minutes or until thoroughly heated. Spread ranch dressing onto baked crust, then evenly spread the buffalo chicken mixture on top, followed by the cheddar cheese and mozzarella cheese. 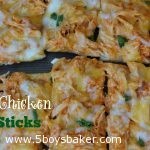 Bake for 8-10 minutes or until crust is golden brown and cheese is bubbly and melted. Garnish with fresh parsley if desired. Cut into strips.